The town of Sogndal is tucked away in the longest fjord in Norway, and it often feels like it's far away from everywhere. 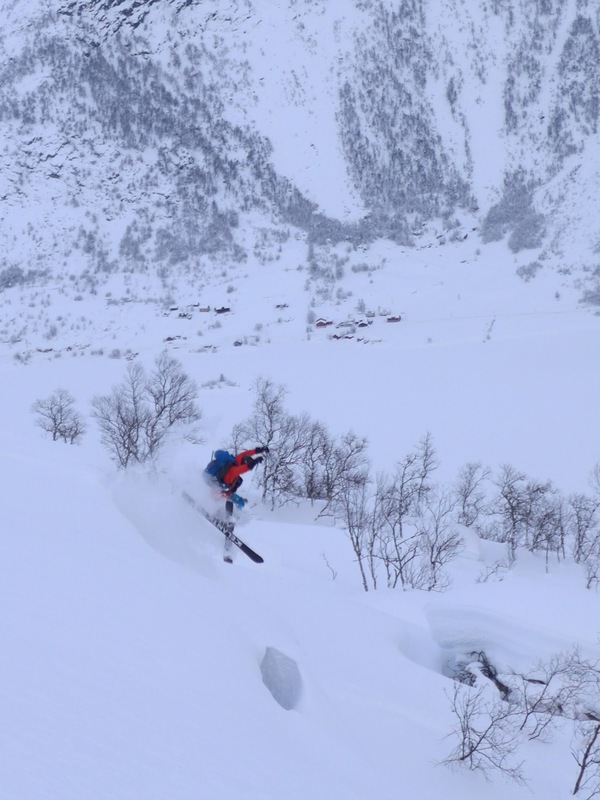 Still, when there is powder in the forecast, the high mountains and hospitality of our friends beckons. 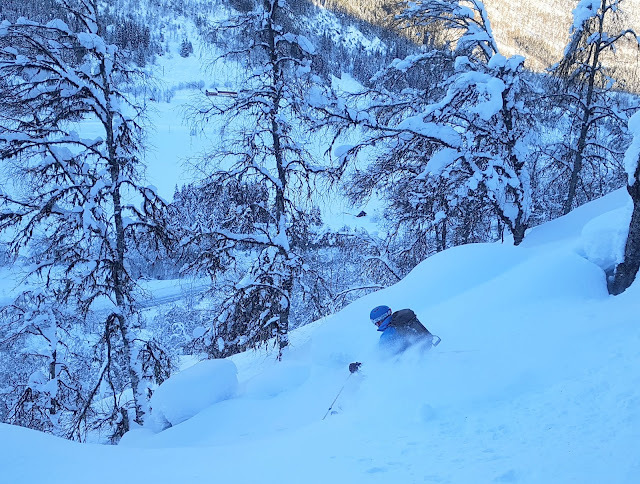 We decided to start the fortuitous early February weekend skiing lift serve in Hodlekve, a tiny lift that manages to service an enormous backcountry - if you are willing to pole for it. The poling was welcome, as it was bitterly cold despite the sun. 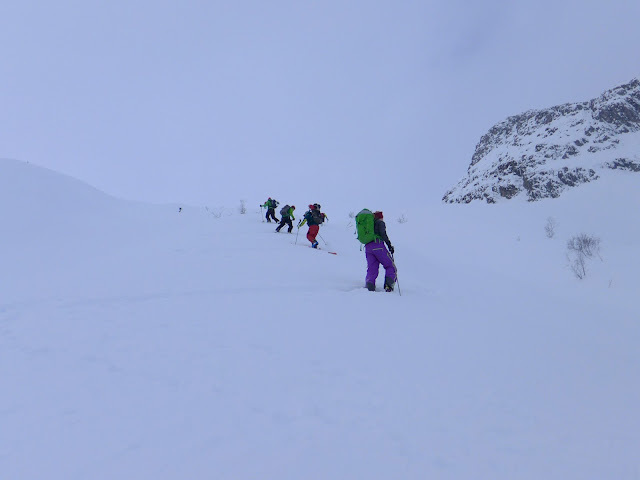 Ten minutes of poles along a flat ridge on each lap brought us to a steep ski run through forest. The condition can only be describe as 'heroic' - it was the kind of day where the landscape was covered in fluffy protection, so falling didn't hurt, and drops seemed to land themselves. The only disadvantage of the run was that it came down to a road, where we had to wait for a bus (the Powder Express) to bring us back to the ski center. At the same time, this provided a welcome break and a chance to actually eat between laps. It was too good of a day to stop skiing for lunch. 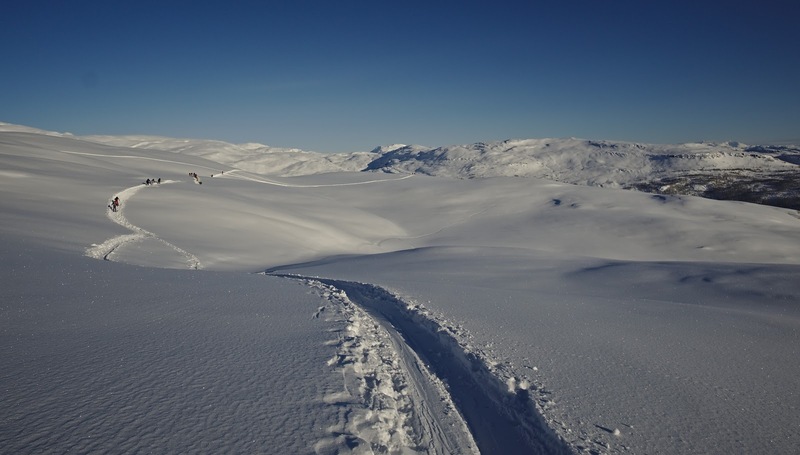 The next day we decided to go ski touring. Using Øyvind's local's wisdom, we set out for a nameless and rarely visited peak only called to as "1554", a reference to it's altitude in meters. One of the reasons it's rarely visited, besides lack of notoriety, is the fact that you have to cross a big lake to get there. Apparent the lake hadn't frozen before it started to snow, so we were a little worried about the ice. To be sure it was safe, we decided to test the ice before we started out, and also brought ropes to cross the lake in rope teams. 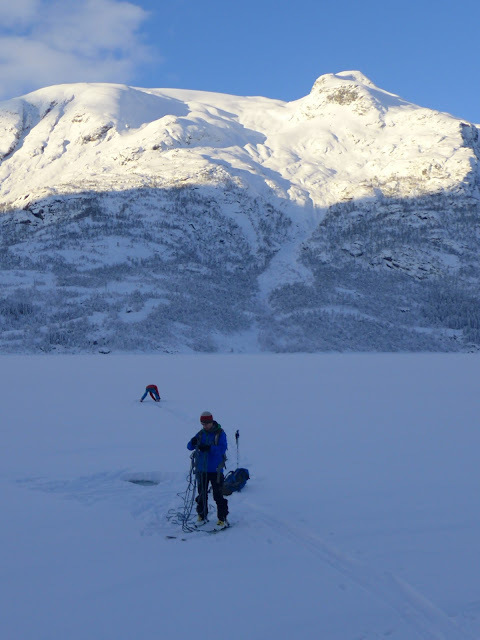 It was -20°C at the parking lot, and my fingers grew numb as I watched Audun and Øyvind chopping away with ice axes. I felt my hands grow numb, but wrote it off to the Reynauld's syndrom I often experience. Finally we roped up and skiied out onto the ice. We crossed the lake at a crawl. My hands were still numb and I tried to swing them at my sides to provoke blood flow. I'll have to put my big mittens on when we get to the other side of the lake, I thought. The coast on the other side of the lake didn't seem to be getting any closer. A wave of nausea hit me and I felt weak. Just keep moving, I told myself, You'll get there eventually. When we finally clambered up on the opposite bank, I needed help to switch from gloves to mittens. I continued to ski extremely slowing, hindered by the nauseating pain of regaining sensation in my fingers. It felt like my nails were going to pop off. In the weeks since the trip my fingertips have felt like they are asleep, a stark reminder of how easy it is to get to close to the edge in deep cold. I won't make that mistake again. 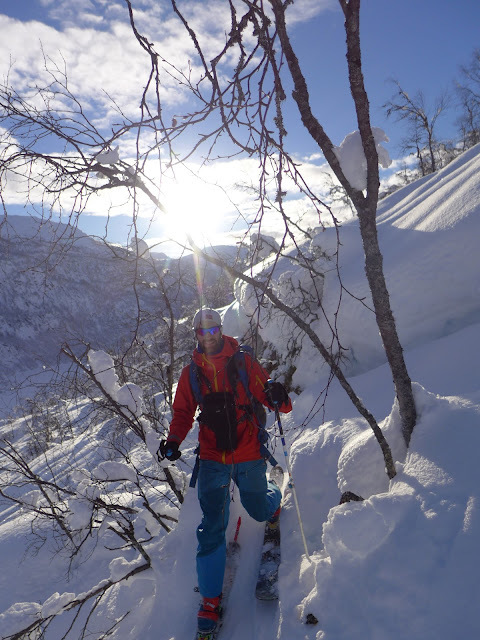 We climbed through a steep, pillow-strewn forest in the sunshine, and began to look forward to an entertaining descent. Then it clouded over and the light grew flat. The climb to 1554 was long and steep, and I hoped the weather wouldn't get any worse. A line of skiers zigzag up a ridge on 1554. After the long slog to the top, 1554 didn't give us any views. In fact, the summit was flat and unassuming. After some snacks and a quick transition we were ready to go. Ingvild bundled up and snacking on the summit. The flat light on the descent made conditions difficult, but there was still lots of fun to be had in the forest. I had a little too much fun, when landing a drop turned out to be a little flatter than anticipated. I rammed my knee into my eye in the landing, basically giving myself a black eye! 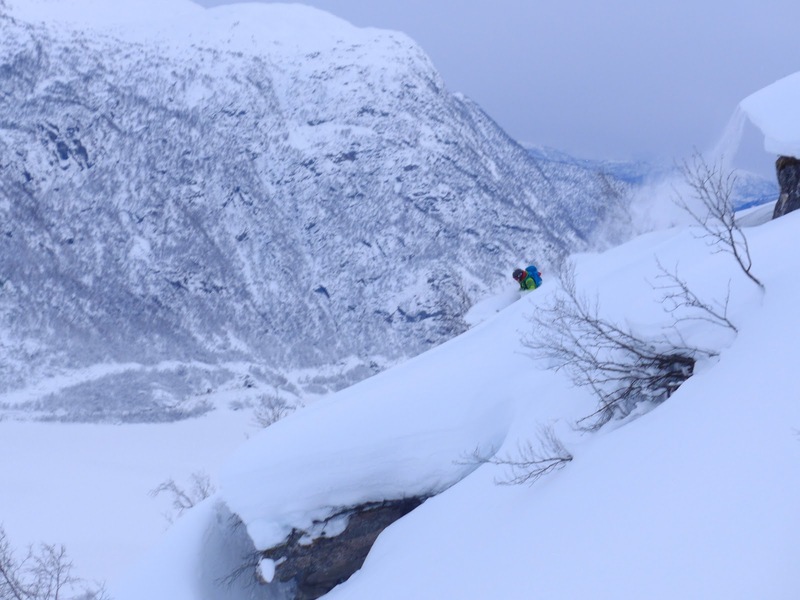 Torfinn on a spectacular line. Audun makes the most of the flat light. It was approaching sunset as we poled across the icy lake, much quicker to cross the second time than the first. Time to warm up in the car, and make the long commute back to flat, but at least snowy, Oslo.